In December of last year, we published an interview with Dale Vince. 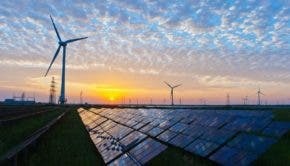 In case you are not aware, Dale Vince built up a renewable energy company in the UK, which is a not-for-dividend company, and has as its aim not just to make a profit, but to use the money it makes to invest in more renewable energy systems and schemes to enhance the environment locally and nationally. Dale also initiated and developed the rapid charging network on the motorway system, starting in 2011, and is therefore mainly responsible for enabling a market for electric vehicles in the UK. He is therefore a very important figure in the clean tech world, and we were very privileged to be allowed an extensive interview. Rather than just repeating what we published before, I have broken the interview up into separate parts, and am running a series of articles, which will include new material by way of a review of what was discussed, what has happened since, and what we can look for in the future. The second was dedicated to the remarkable Electric Highway fast charging network in the UK started in 2011, and largely responsible for creating a market for electric vehicles in the UK. This is the third article in the series where we delve into Dale’s plans for the future. Dale Vince, the founder and Managing Director of Ecotricity, gave this interview on 16th November 2017, and I am very pleased to present the third part of it here. Q: Things have gone from strength to strength since you started, with more embedded supply contracts, and by 2015 supplying nearly 90,000 homes with green energy. Ecotricity is now a well-established force in the UK energy market. It has been a huge success. Do you still have big ideas for the future, and do you intend to diversify into energy sources other than wind, such as solar farms? Solar: Yeah, we’ve built a solar farm. We built the first one in 2010, just before the Conservative government closed it down as an industry with a future. But that’s coming back: the price of solar panels has fallen so quickly since then that we can see the day coming soon when we can recommence our solar program. Marine Hydro: We’ve got some interests in wave power and tidal power: these are R&D projects at the moment. Gas From Grass We’ve got green gas. We unveiled a concept recently to make gas in England from grass. We published a paper that showed that maximizing land use in Britain, we could produce enough gas for just about all of Britain’s homes from green gas, which is carbon neutral, creates massive wildlife habitats, and won’t compete with food production. It would create 100,000 jobs, and be of massive economic benefit to this country. Energy Storage: We are just getting into grid-scale energy storage, and have planning permission today for 10 MW, our first big project, and we have home-scale energy storage with our black-box, which has been in R&D for a while, and should be in the world in the first quarter of next year, and that’s quite exciting. Water Purification: We have a water device coming out of our labs next year, which recycles all our household waste water, from rain, drains, and even toilets, and turns it into better than tap-quality drinking water, which is quite exciting. We have various other applications in development. Electric Vehicles: And yes, have we got any big ideas? Yes, our electric car and electric van projects, which are going really well, on the cusp of mad growth, because the sector is that way. Eco-Talk Mobile Phone Service: We are just launching a UK mobile phone service, called Eco-talk, this year. That’s a carbon-free mobile service, piggy-backing on one of the big networks, harnessing our customer phone bills, and using them for buying land to create habitats for nature. Top-Secret: And then, one more top-secret project that will be announced next summer, which for me is probably the most incredible and crazy idea we’ve ever come up with. Anything we have left out? Q: Top-secret? Sounds intriguing. I’ve just signed up to the phone service: I was just waiting for the contract to end with the previous supplier. It has been great to have this opportunity to ask you questions about the huge achievement that Ecotricity has made towards putting green energy on the map. This has been your own personal vision, and you have provided the driving force to bring it to fruition. It all makes an inspiring story. Is there anything else you would like to say, to add any details to that story, which we have not yet covered? No, I don’t really think so. The questions have been well researched, and well structured. Thank you for the opportunity. Q: Thank you so much for this interview. I have learned such a lot, and your answers have been so insightful, and detailed. It has been really fascinating, and I’m sure our readers will feel the same. We wish you and your enterprise every success in the future. I can’t wait to hear more about your EV projects, and that top-secret project you mentioned, when its finally announced. Perhaps you will allow us to do an article about those too. Thank you very much. I’d love to have a peek at his R&D lab to see all those fascinating projects in the pipeline. Maybe a chance for a future article. I did approach Ecotricity for an update on these items but their response was, “come back to us in about 3 months time.” I am not sure if that was a “don’t call us; we’ll call you” type of response, but either way it was not very helpful, and Dale’s Top-Secret device remains as secret as ever. As I mentioned in Part 1 of this series, Dale is working on an eco-park, which will include a new 5000 seat stadium for Forest Green Rovers. The 10MW of storage he mentioned appears to be at Alveston in Gloucestershire, which is the last onshore wind farm they have been allowed to build. As I have mentioned before, the perverse UK Tory government designates fracking wells as “Nationally Significant Infrastructure Projects,” allowing them to be foisted on to local communities and local governments, who are fighting every inch of the way to stop them. Onshore wind farms, on the other hand, as they might obscure the view from some wealthy Tory donor’s mansion house windows, are a blot on the landscape, to be obstructed by corrupting the planning laws to make it almost impossible to get permission, and also by banning onshore wind farms from bidding in renewable energy provider auctions. As the old biblical saying goes, “By their fruits you will know them.” Our Tory government is well known for its honeyed words and bitter deeds. Britwind is a step up for the small wind industry, delivering 100% British windmills to landowners, and businesses across Britain. Britwind brings big wind performance to small wind – producing energy at almost half the cost of the best selling small windmill on the market. The company unites experts with unrivalled experience, and ability from both the big, and small wind industry – designing radical new horizontal, and vertical axis windmills that will bring lower bills, and energy independence to people in Britain. And it’s all designed, and made right here in this country – vertically integrated, fully British from start to finish. There’s plenty of wind, in built up areas, and other places that don’t suit a full-sized, or conventional windmill. The Urbine is what’s known as a ‘vertical axis turbine’ – instead of having blades on one side that rotate like the hands of a clock (for example), and face the direction of the wind like a conventional (old school) windmill, vertical axis windmills rotate around their tower, and the blades catch the wind, whatever direction it comes from. There’s a certain elegance in the look of these vertical axis machines – there’s also an elegance in their engineering, and their interaction with the wind. That’s what attracted us. Ecotricity has today presented the government with two alternative tidal lagoon proposals, ahead of a joint select committee review of the Swansea Bay tidal lagoon project ……(Swansea Bay has since been rejected on cost grounds)……. The two new plans unveiled today are in the Solway Firth, one on the English side of the border, and the other on the Scottish side. Both projects would generate as much electricity as the Swansea Bay proposal, but at half the cost to build. That means they can make electricity for half the cost. The superior economics of these proposals are delivered by siting the lagoons offshore instead of onshore. Offshore tidal lagoons cost less to build, operate more efficiently, and have significantly less environmental impact. Ecotricity have partnered with Tidal Electric – the originators of the tidal lagoon concept, to develop the Solway sites; …..
As an island we’re surrounded by the sea, of course we are – less obvious perhaps is that it’s a potentially vast source of renewable electricity, if we can develop the technology to harness it effectively. Whether it’s the ebb, and flow of the tides, the movement of marine currents, or the oscillation of waves, these truly vast energy sources present serious technological challenges – electricity, and water aren’t a natural fit after all 🙂 -, and they’re not currently commercially viable. We’d like to add the power of the sea to our green electricity mix, to join the power of the wind, and energy from the sun. So we’re working in partnership with a number of organisations to see if we can turn the concept into reality. We already produce green energy by harnessing the power of the wind, and the sun – now we’re developing seamills using the power of the sea. This innovation is called Searaser, and it gives us low cost energy on demand. It’s such a simple design, and we believe it’ll produce electricity cheaper than any other wave-power technology, or indeed any other type of renewable energy. Potentially it could be cheaper than all existing sources of electricity – including gas, coal, and nuclear –, and it’s carbon free. Most existing wave technologies generate electricity in the ocean environment. But as we know water, and electricity don’t mix – and seawater is particularly corrosive – so most other devices are very expensive to manufacture, and maintain. Searaser pumps seawater using a vertical piston between two buoys – one on the surface of the water – the other suspended underwater, and tethered to a weight on the seabed. As the ocean swell moves, the buoys move up-and-down, and the piston pumps pressurised seawater through pipes to an onshore turbine. This produces electricity. Searaser units could also supply energy on-demand by pumping seawater into a coastal reservoir, with a hydropower turbine, solving renewable energy’s problem of fluctuating output. The Electric Highway, Britain’s leading electric car charging network, will expand into London next year, (this year), with 30 new electricity pumps set to be installed on petrol station forecourts. The Ecotricity pumps will be installed on Motor Fuel Group’s (MFG) Shell, BP, and Texaco branded service stations in the first half of 2018. The network was launched by Ecotricity in 2011, and has now powered almost 50 million miles of emission-free electric driving, all supplied by energy from the wind, and the sun. Ecotricity continues to expand as a domestic supplier, and it now supplies 200,000 homes. That roughly translates, at an average energy bill of £1000 per year, to £200,000,000 turnover for domestic supply alone. Ecotricity also supplies businesses, and has revenue from the Electric Highway. It is a huge commercial success, and remains a private company. It has raised £50,000,000 of extra capital by issues of “Green Bonds” to members of the public wanting to invest in Ecotricity. These Green Bonds not only raise capital, but provide an opportunity for savers to be able to join in the green revolution by investing, and benefiting financially.